Photos by Chad Ryan | The Journal Gazette Suebhana Graf, left, and Drake Chamberlain make a heart shape with their hands as they dance during the Dances of Universal Peace retreat Sunday at the Fort Wayne Dance Collective. Attendees from several states came together to participate in prayer, song, and moving meditation at the weekend-long event. They sang, they danced. They laughed, they smiled. 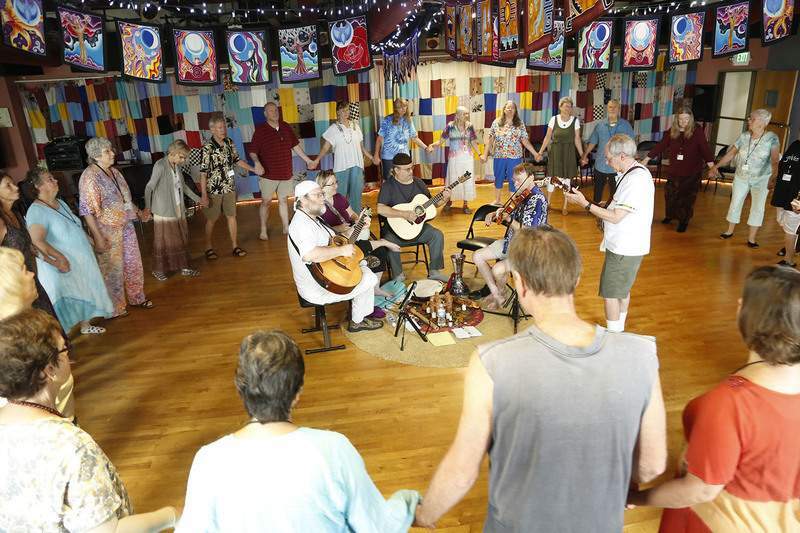 It was a peaceful atmosphere Sunday inside Fort Wayne Dance Collective as people from across the country gathered for the final day of a weekend retreat with Dances of Universal Peace. 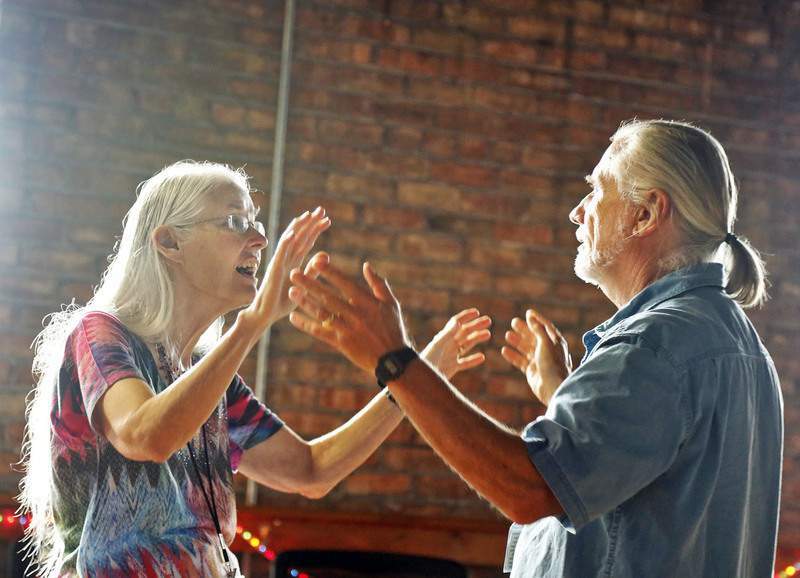 Dances of Universal Peace is a spiritual path that honors all of the world’s major religious and spiritual beliefs, said Kim Miller, a volunteer with Fort Wayne Dance Collective who helped organize the three-day event. Miller has had a hand in organizing the retreat for the past seven years. "It’s about honoring many spiritual traditions in the world, the mainstream spiritual religions and also other spiritual paths," Miller said. "Weekend retreats happen all over the world, but the more common thing is local dances just for small areas of people." Dances and music could come from any number of faiths or spiritual principles, Miller said, including Christianity, Judaism, Buddhism, Hinduism, Native American or Sufism. "There’s a strong connection between Sufism and the Dances of Universal Peace," Miller said. "A lot of people are followers of both paths, but you don’t have to be of any spiritual tradition to participate in the dances. The spiritual expressions are broad and general, in many cases, but the whole idea is to continually radiate out this positive energy, this energy of love, peace, harmony and beauty to the world." The Dances of Universal Peace were introduced in the late 1960s by Samuel L. Lewis, a zen master and Sufi teacher, Miller said. Lewis was inspired by Hazrat Inayat Khan, who introduced Sufism to North America, and Ruth St. Denis, a famous modern dancer. "His quest became to provide a high for those young people that would not be including drugs. A spiritual high, instead of a chemical high," Miller said. "They just progressed from there." Now, dances are done all over the world. FWDC’s summer retreats began in 2009 with an Inspire Grant from the Foellinger Foundation, Liz Monnier, the dance collective’s former artistic director, said. "We traveled to Indi­anapo­lis and we saw what a circle was like – Kim had already done it a lot but it was new to me," Monnier said. "We decided to do a big thing to kick it off. That was 2009 and we’ve done a summer retreat ever since." There’s also a smaller local circle that meets about once a month in collaboration with Sophia’s Portico, Monnier said. "People come from all over the country to participate in the retreats," Monnier said. She noted there were about 50 participants this year. Jessica Noe, who leads her own Dances of Universal Peace, is one of those travelers. Noe, who lives in northern Michigan, drove five hours to participate in the retreat, which featured guest leader Grace Marie of Fort Collins, Colorado. "I came to experience another leader who’s been leading for many, many years and also to reconnect with a lot of people here who I know and dance with maybe two or three times a year," Noe said. Noe said the dances bring her joy and she feels a deeper connection with people than can be found in everyday life. A heart connection, she called it. "I am deeply committed to peace in the world and I believe that when we recognize the common thread of love, community and unity that is in every tradition, then we will be accepting of each other and we won’t have these differences that divide us and these prejudices and all of the stuff that’s going on in the world right now," Noe said. "We do this to put that energy out into the world and to touch people’s hearts and realize that we’re all connected."